Nothing beats the fun of learning with stickers! Arranged by classification, children use the outlines, animal names, and facts to match up the sticker with the correct animal placement. Learn about primates, birds, reptiles, amphibians, fish, and invertebrates! More than 600 colorful photographic stickers are included, as well as different ecological scenes with checklists of the correct animals to place in each geographic area. 53 pages, paperback. Kids will learn all about the animal kingdom with this spectacular, super-sized sticker encyclopedia. Its packed with fascinating facts! 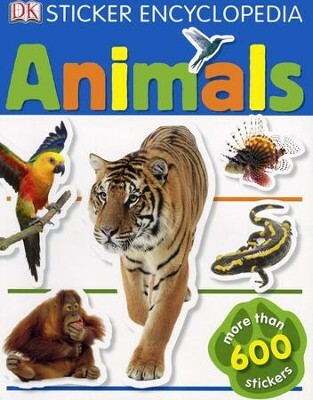 Choose the stickers that fit in the spaces to complete your own encyclopedia of animals. Put the extra stickers in wherever you want! Theyre easy to peel and can be used more than once. With over 600 stickers, this is the perfect book for becoming an expert on the worlds weirdest and wildest animals. I'm the author/artist and I want to review Animals: Sticker Encyclopedia.